There is an old superstition on the island of Susak called ‘Mrak’, which means ‘dark or darkness’ in Croatian. It is believed that ‘Mrak’ carries evil forces that harm, in particular, children, their drying clothes and even wandering adults. It seems the universal childhood fear of the dark night follows Susak’s inhabitants into adulthood. The myth suggests that the sole protection against ‘Mrak’…is fire itself. A bonfire, a fireplace, a torch or even a lit cigarette will do. If you decide to go for a stroll across the island at night, smoke all the way or carry a flaming torch. No myth is plucked out of thin air or exists without roots in history. Darkness and light have toyed with our notion of right and wrong, of good and bad since time immemorial. 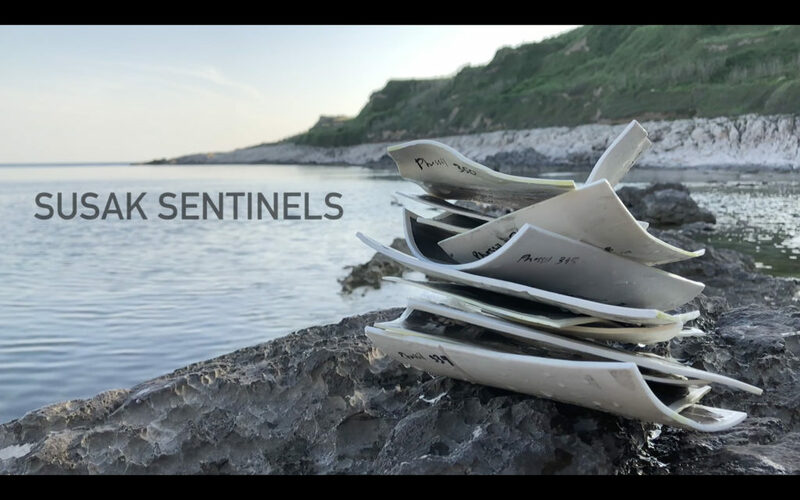 Susak Sentinels was conceived by Charlie Bonallack to perpetuate, to stoke this quaint myth and possibly offer the island permanent protection from future maleficent influences. Susak Sentinels is a series of twelve hand painted images on biscuit porcelain (see Phossils) which are then fired. Each painting is an interpretation of a photograph (that contains a flame of sorts) contributed by artists participating in SUSAK EXPO 2018. These porcelain paintings, resembling fossilized photographs (phossils), were dropped by Charlie into the sea at various dedicated GPS locations in a ring around Susak; 12 individual records of moments with fire – out of sight in the depths, inextinguishable and forever part of the myth ‘Mrak‘.